As you might have guessed this is not a blog with gorgeous drawn illustrations. Here’s what I’ve got today. These diagrams apply to psychiatry as I see it specifically – but can obviously be extrapolated to other areas of medicine. 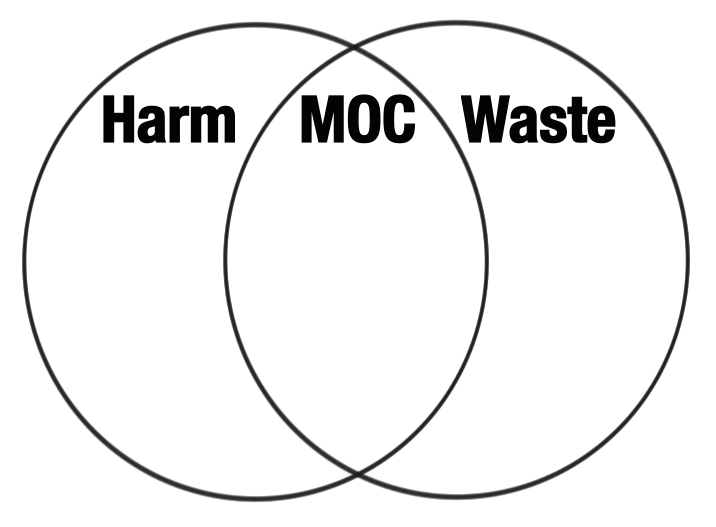 They are an exploration of intersecting areas of systems problems related to conflict of interest in medicine, one of which specifically is MOC. Of course one might say anything or anyone has an angle, but bear with me. MOC is a chimera of many different types of problems. I ended up canceling intermittently scheduled weeks of patient care, of course. I mentioned MOC twice to patients who were commenting that I seemed to be taking more time off than usual and wondered if I were ill. Almost everyone was questioning me about the amount of time out of the office. It was impossible, though, to study while working. One person said during an appointment “The MOC exam? But why? I read about that in Newsweek! Dr. Gordon!! It’s a scam!” (2,3,4) I complimented this person on being so highly informed and merely said that as of now it was something I felt I had to do but that hopefully we could press for changes. (5,6)The American Association of Physicians and Surgeons, AAPS, is the one organization really working hard on behalf of physicians to preserve the very threatened relationship between physicians and patients. That involves, among other things, trying to prevent MOC from becoming further entrenched in the law and the interstate license compact. (8) Other organizations have taken small but ambivalent steps. Like most of my colleagues, I declined to ask my patients for feedback, because in psychiatry this is especially problematic. The American Board of Psychiatry and Neurology may recognize this and has made this feedback module optional for now. The American Psychiatric Association has at least taken a stance on MOC stating that Part IV in general is a burdensome problem. (6) But, in any case, on any front, to little avail. The ever-evolving requirements of ABPN Maintenance of Certification continue to burgeon. The patients from what I can tell generally see it for what it is- something else generally makes doctors less available, and will continue to do so, which isn’t good for them. But where is the concern among psychiatrists? We will be decredentialed if we fail these exams. Careers and reimbursement are at stake. I don’t understand how my colleagues think this is reasonable. It is past time for psychiatrists to join the gastroenterologists, the anesthesiologists, the cardiologists, the rheumatologists, the nephrologists, and everyone else who sees that this massive unproven and conflicted waste of our time and resources is bad for us, therefore bad for patients, and needs to be addressed. NBPAS, an alternative board (5), has a ways to go in terms of being accepted but it is making headway. The monopoly must be broken. The legal hurdles are huge but the battles must be fought. Please, if you are grandfathered, stop and consider the patients and the careers of your colleagues, as well as the morale of the profession, and get involved. Having brought this up with colleagues in psychiatry, I have found people both more apathetic and less informed than I expected. In internal medicine, where the financial scandal has broken wide open, the awareness is much higher. Not much grassroots movement has happened with us. One grandfathered colleague commented “it’s not really a major issue, relatively speaking.” Another young colleague compared it to taking an eye exam at 10 years to keep one’s drivers license. Clearly he has yet to study for one of these and understand that his job may be on the line if he does not pass. Others have written of the costs of the exam and the finances of the American Board of Internal Medicine and the American Board of Medical Specialties 24 boards, which are astounding. You can read about that elsewhere. The huge sums of money are keeping whole testing and review class industries flush with our money. The whole web of nonprofits is a bona fide financial sector unto itself by now. (7) There is a useful cartoon in the references. The money raised and spent by these so-called nonprofits could help millions of patients. Here’s the non-monetary cost, though. In case you haven’t done this recently or you think it’s not a big deal, I thought I’d break it down. Here is why I don’t want to do this again, really. It was actually destructive. Here is what I did not do as a result of that exam. I gave up teaching partly in preparation for it. I did not go to one conference for more than a year. In fact, I missed three that would have been really good. I am still catching up on paperwork now so I still am not doing much reading. I did not yet train to prescribe suboxone, which, in the midst of our opiate addiction epidemic, would have been a far better use of time and resources. I did not start my next project or write that next essay. I took fewer new patients for months and studied in all the time I took “off.” I did not have time to learn anything beyond what was billed as “high yield” for the exam, which included over 40 hours of lectures and thousands of questions. I didn’t go to coding or eprescribing or malpractice seminars. I didn’t learn about new legislation and mandates. I did not go to Albany for any of the meetings I wanted to go to for the professional causes I care about. I wrote no letters to Congress. I did not go to one committee meeting or professional event or buy one single book that was not on a board-related topic. I diligently stacked up all the journals that came but didn’t open them. I did not apply for NBPAS. (5) I did not learn any new technology or new skills for anything at all. I have lots to catch up on. I lost a big chunk of my life, just in case I should need this document to work. In other words, the year put my career and lifelong learning not just on hold, but literally in reverse. I know less about a lot now than I would if I hadn’t taken the exam. I see myself taking more than a year to catch up on all the things I should have been doing. Some of it I now don’t have time for at all. 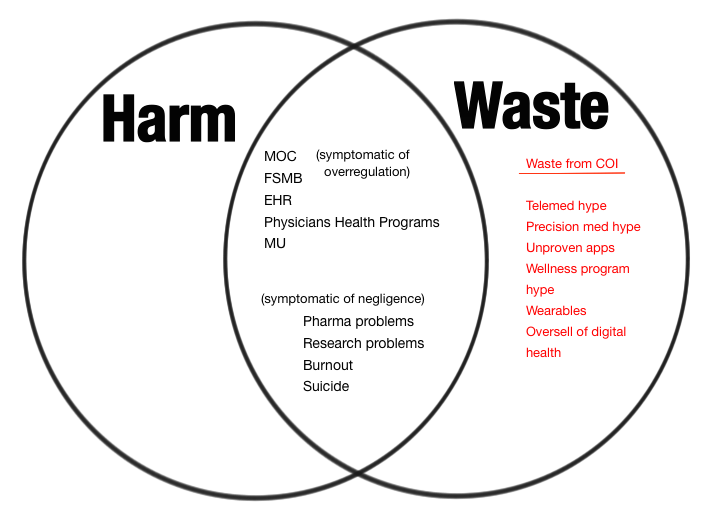 It exists in an intersection of harm and waste related to COI. 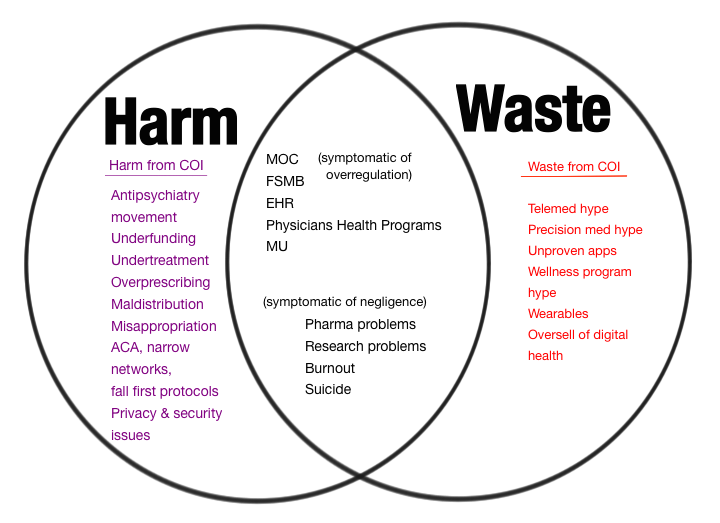 These two massive self-perpetuating systems of problems underly much of what I think is wrong with medicine today. MOC, along with problems like the mess made by Electronic Health Records, the Federation of State Medical Boards,(8), Meaningful Use, Physician Health Program ethics problems (9),malpractice issues, problems with pharmaceutical companies, research issues, burnout and finally physician suicide are some of the most destructive issues the profession faces. 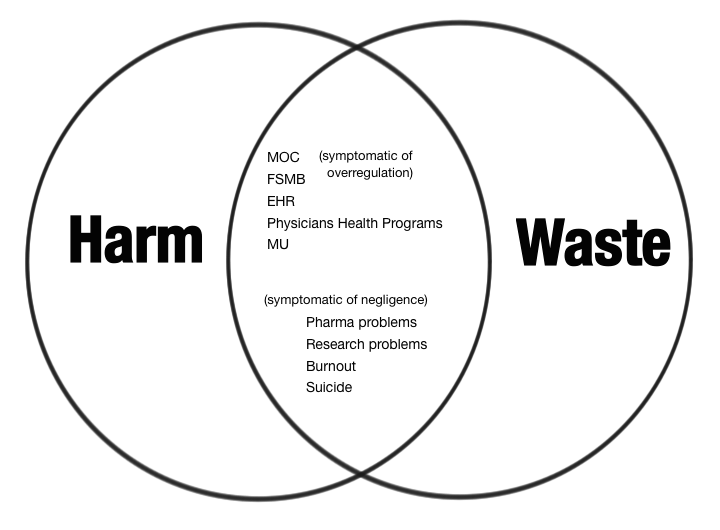 They all exist at the intersection of the powerful self-perpetuating landscapes of harm and waste, often due to conflicts of interest in medicine. Note that some of these at this intersection are due to overregulation, and some due to negligence. That is at the essence of conflict of interest. The resources, concern or investment in managing a problem are misguided and inappropriate, either too high or too low due to self-reinforcing torque. This is the zone that is lethal to the humanity and professionalism of psychiatry at a moral level. These are huge problems that need to be solved by systems that don’t understand how medicine works and, so, as a result any progress has been incrementally slow, often even backwards. Some of these problems are failed solutions to other problems that still exist and in the absence of reinvention of a paradigm, they cannot simply be dismantled. Any progress at all on MOC has largely been due to the work of a few very dedicated writers like Kurt Eichenwald (2,3,4) and Dr. Wes Fisher (1) Slowly it seems the world is waking up to the fact that MOC is a deeply entrenched and very difficult problem that cannot be allowed to endanger careers, erode morale, dumb down lifelong learning and dilute professionalism, the things it purports to protect. Sometimes we use the term “perverse incentives” to describe the self-perpetuating nature of some of these big systems problems, but I see it as more complex than that. There are so many ways to look at how problems like this beget each other. It is beyond the scope of this blog. These problems, as byzantine as they are, cannot be ignored by physician leadership. They are already the undoing of us. The wheels are turning too fast. But my point is, sadly, that the deeper one looks into these domains the more all these problems seem overdetermined, entrenched and connected in cascades. Some might say waste is harmful, by definition, or that harm might almost always be wasteful. It depends how far downstream you follow the problem. I wish people were as interested in quantifying waste and harm from conflict of interest problems like these as they are in, say, mammograms. Mammograms are of central importance to patients, don’t get me wrong. But why doesn’t anyone seem as concerned why are our patients dying without screening or treatment? These are all very urgent manifestations of the current chaos and, because, as you can see, the physician patient relationship is literally nowhere to be found in these diagrams. There is little to no attention being paid to it at a systems level. These destructive complex systems issues of the waste and harm from conflicts of interest work both ways. They both cause and are amplified by the problems that define them. The professional organizations, for example the Pennsylvania Medical Society, are trying to help give NBPAS (5)the credibility and power to break the ABMS monopoly on MOC. The MSSNY and other state medical societies have passed resolutions to try to prevent MOC from turning into MOL. (10) There is some awareness, now, more than a year ago for example, that this is having destructive consequences. But if MOC is to be a permanent tax on the professional and personal lives of doctors, our professional organizations must come to fully understand what is the unaffordable price. In psychiatry we have an aging workforce and severe shortages. We are, many of us, already burned out despite the degree to which we have opted out of third party medicine. If MOC is allowed to cause people to be unemployable, lose their jobs or force them to retire, everyone suffers. Unfortunately there are people who stand to gain from the status quo. This must be understood and addressed as such. These multi-determined problems are among the worst that are putting psychiatrists, and therefore, our vulnerable patients at risk. Let’s all stop focusing on whatever urgent box-ticking form is distracting us just long enough to see the big picture.